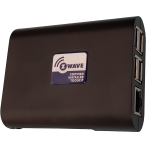 - The Internet of Things is powered by Z-Wave. Kwikset Convert is a Z-Wave connected smart lock that replaces an interior deadbolt but uses the existing exterior lock hardware. Data from a recent survey conducted by PCMag on the future of the #smarthome reveals 30% of US consumers would rather connect the appliances they currently own, rather than purchase brand new smart products. Come join the Alliance this Spring at the #ZWaveSummit May 8-10 in Amsterdam for an opportunity to network with members, receive #ZWave technology training from #IoT developers, and learn current marketing #tips.